We started FreeDOS in 1994 to create a free and open source version of DOS that anyone could use. We've been slow to make new releases, but DOS isn't exactly a moving target anymore. New versions of FreeDOS are mostly about updating the software and making FreeDOS more modern. We made our first Alpha release in 1994, and our first Beta in 1998. In 2006, we finally released FreeDOS 1.0, and updated to FreeDOS 1.1 in 2012. And all these years later, it's exciting to see so many people using FreeDOS in 2016. If you follow my work on the FreeDOS Project, you should know that we are working towards a new release of FreeDOS. You should see the official FreeDOS 1.2 release on December 25, 2016. We are almost ready for the new FreeDOS 1.2 release! Please help us to test this new version. Download the FreeDOS 1.2 RC2 ("Release Candidate 2") and try it out. 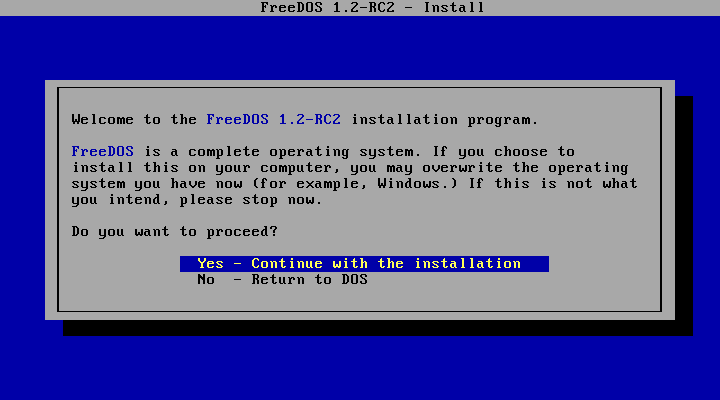 If you already have an operating system on your computer (such as Linux or Windows) we recommend you install FreeDOS 1.2 RC2 in a PC emulator or "virtual machine." Report any issues to the freedos-devel email list. You can download FreeDOS 1.2 RC2 from our Download page or at ibiblio. Thanks to everyone in the FreeDOS Project for their work towards this new release! There are too many of you to recognize individually, but you have all helped enormously. Thank you!